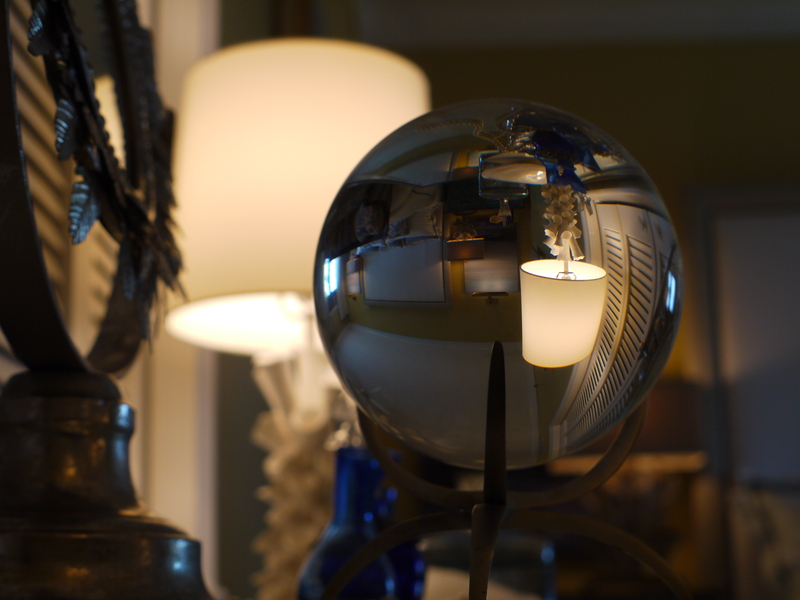 I had the pleasure of working with this client after she walked into the store looking for a piece of furniture under her t.v. that would be natural and Art Deco-inspired. 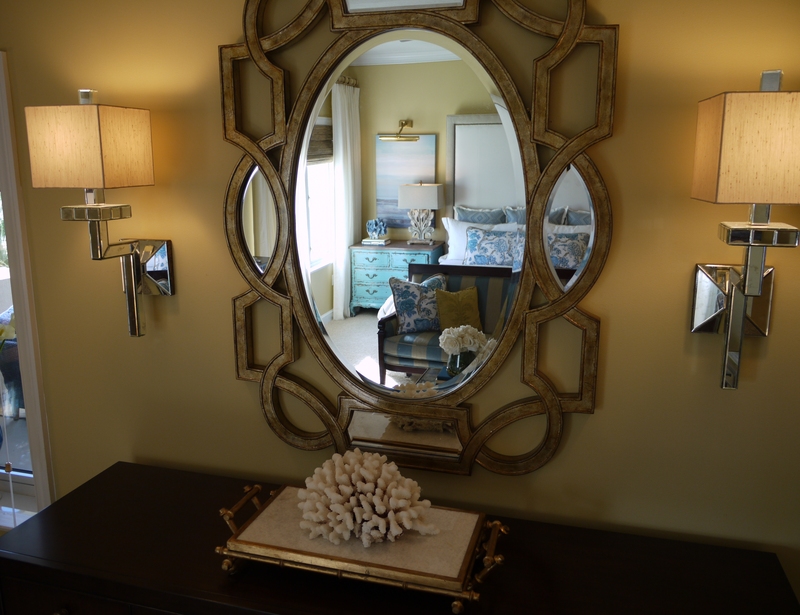 I happened to have the perfect piece in mind, which she ordered and we installed. 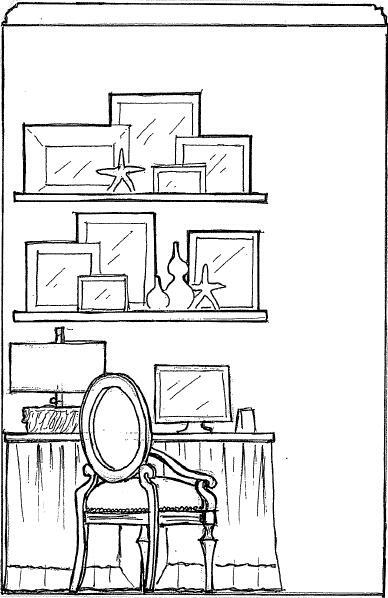 Months later she called me, and much to my delight, wanted my help in giving the rest of her condo a facelift! 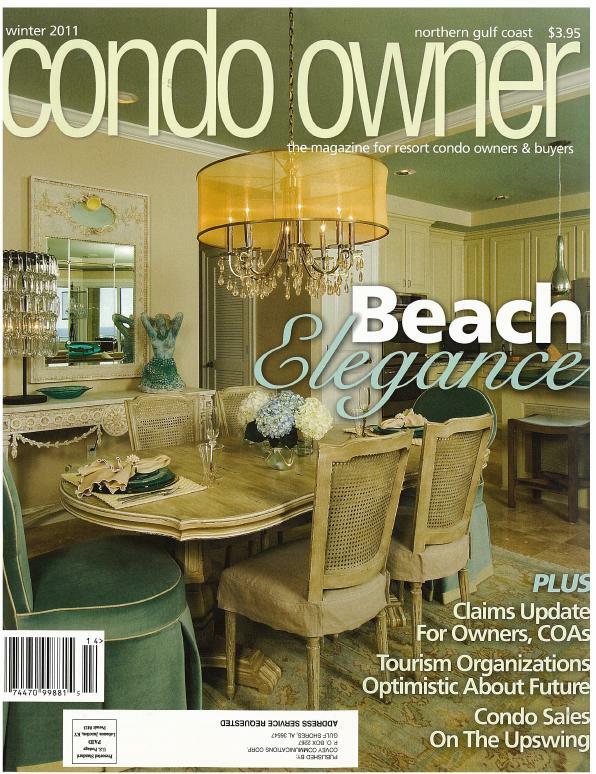 Her requirements were that I work with her prized oil painting as the focal point and inspiration, and give it a light, airy and beachy, but Deco-inspired look. 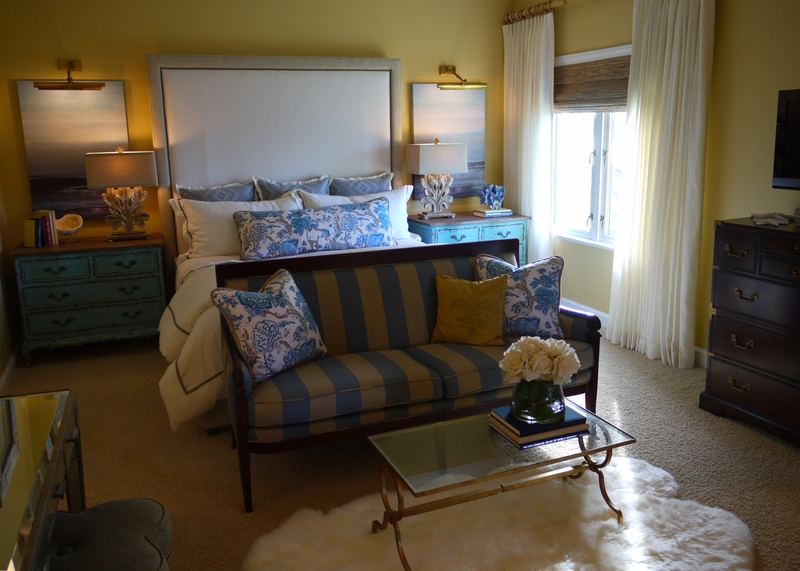 She wanted to keep her yellow walls, and wanted me to use lots of blue in the design. I immediately began coming up with a texture-rich design that would mix chrome, chipping paint, natural woods, glass and linen all together, along with a color palette that complemented her painting. 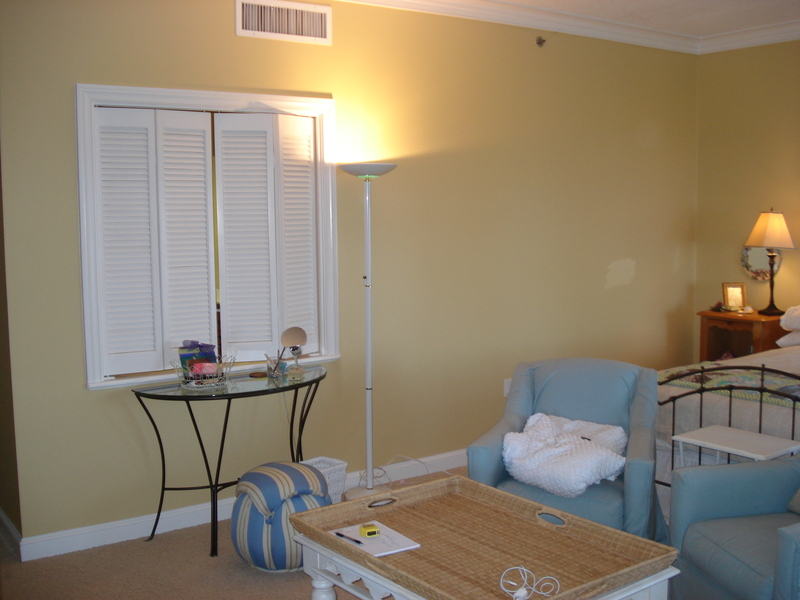 Above are pictures of the Living Room before and after the facelift. Before, her prized oil painting was not living up to its full potential. I solved this by giving it the champagne floating frame it deserved, and adding touches throughout that accented its colors. The navy was pulled from the shadows, the teal from the shutters, and the cerulean from the background of the art. 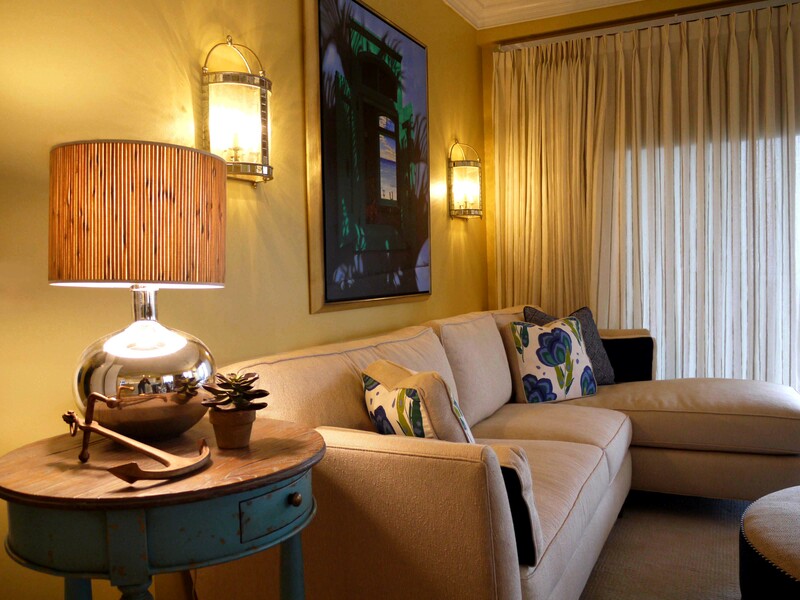 I also gave the art wall more importance by flanking the art with two lantern sconces by Currey and Company. 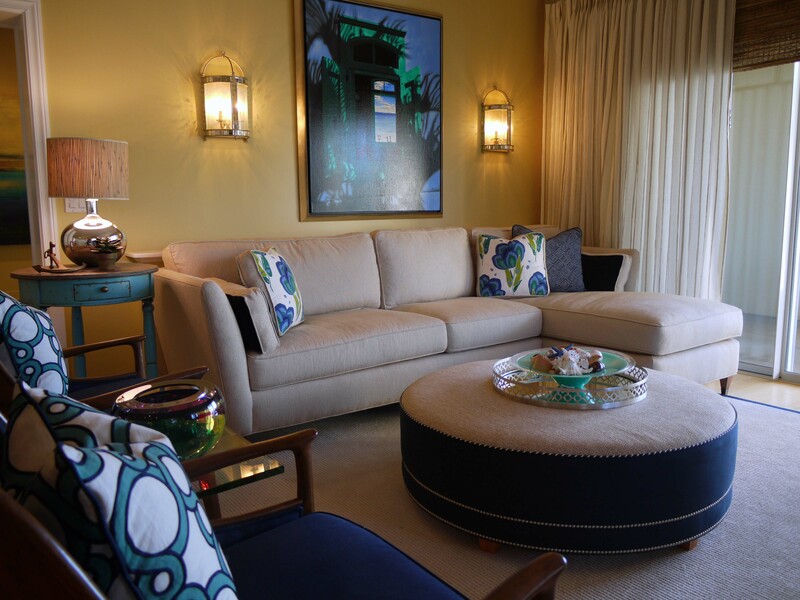 This sofa/chaise sectional by Drexel Heritage is a favorite of mine, as it is very comfortable, and I love the clean lines and boxed arm pillows. 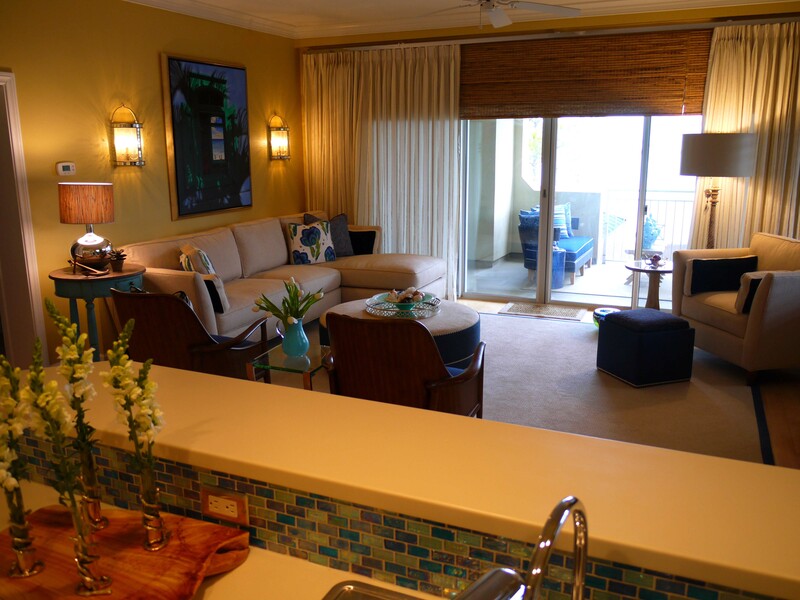 It provided more seating, as well as a more inviting and relaxing atmosphere. 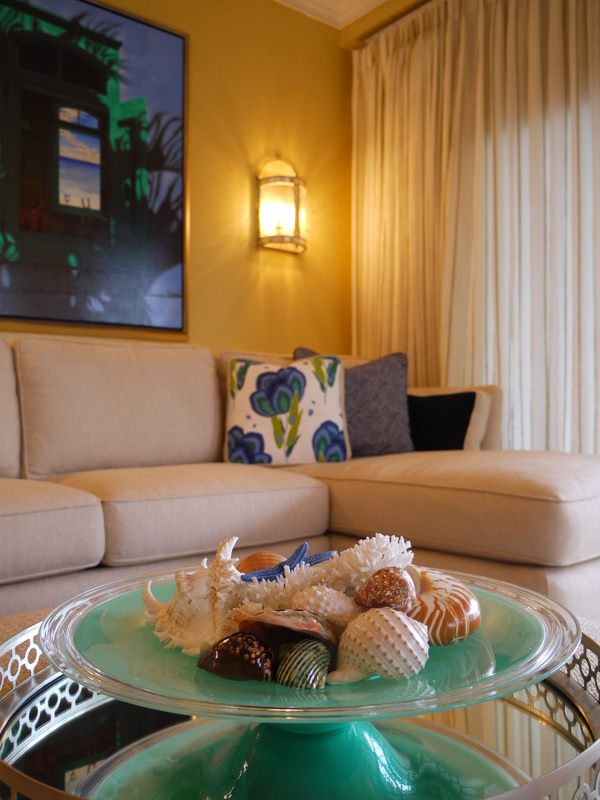 I added this anchor, not only to create a nautical feel, but also because the Condominium is named “Anchorage”. The client got a kick out of this. 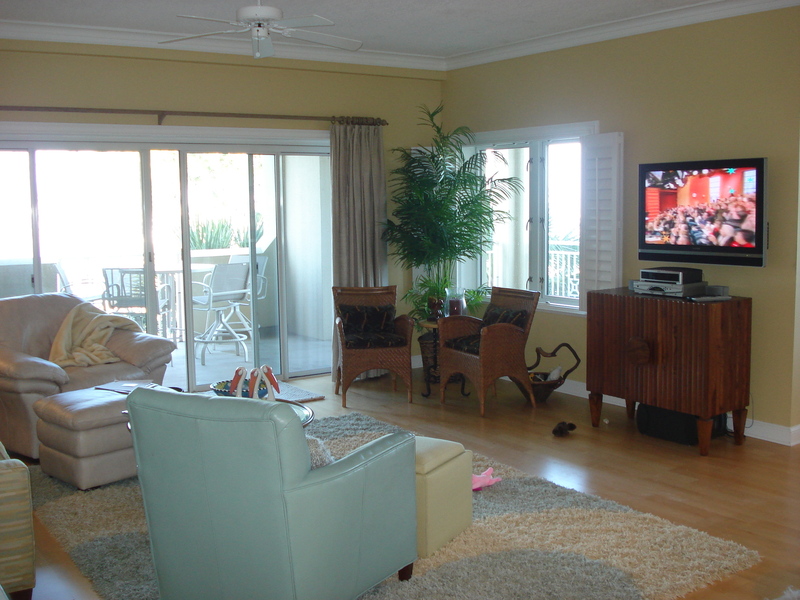 Here is another view of the Living Room before the change and after. Before, the space was not being used in the most effective way. 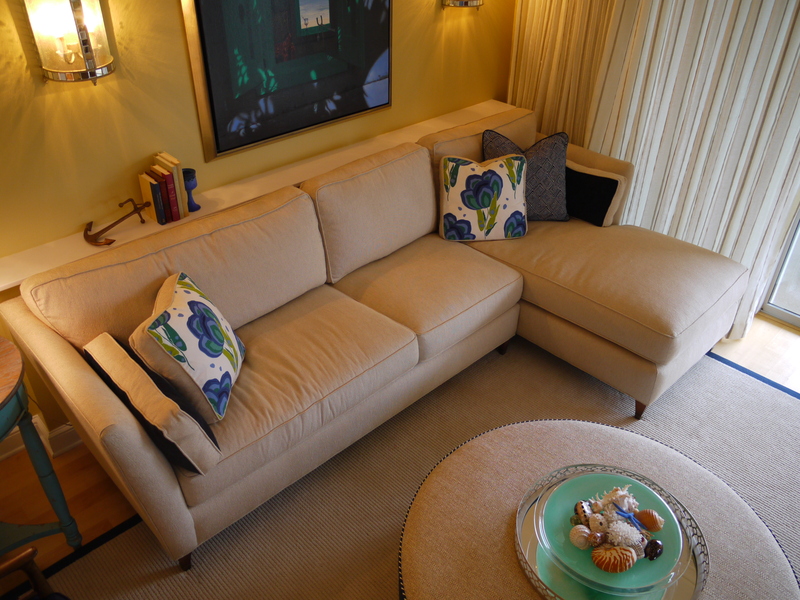 The corner opposite my “L-shaped” furniture layout was cleaned up with a larger chair that matched the sofa and created a more comfortable vignette. 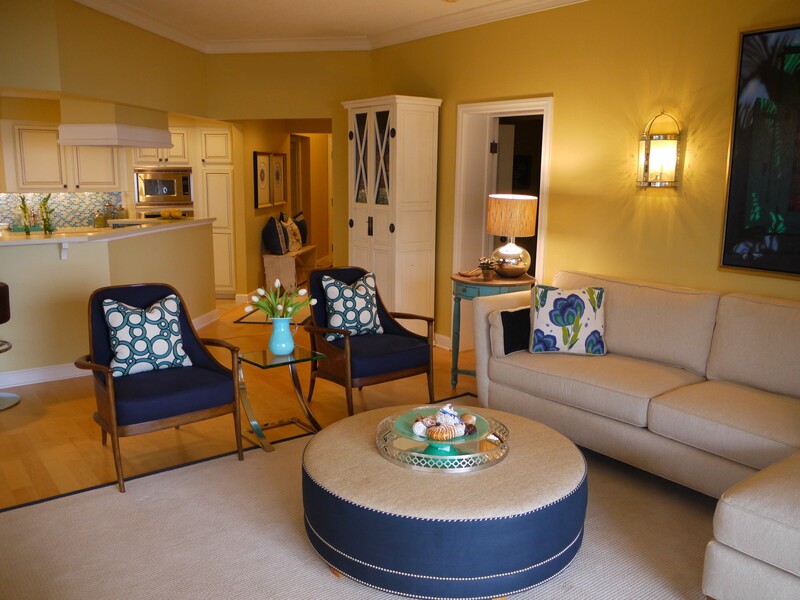 The blue storage cube you see in front of the chair is actually the same green ottoman pictured in both “before” pictures. It was recovered in navy linen on the bottom, and the lid was covered in a navy velvet coral fabric. I had the upholsterer add silver nailheads to the bottom for the last finishing touch of sophistication. 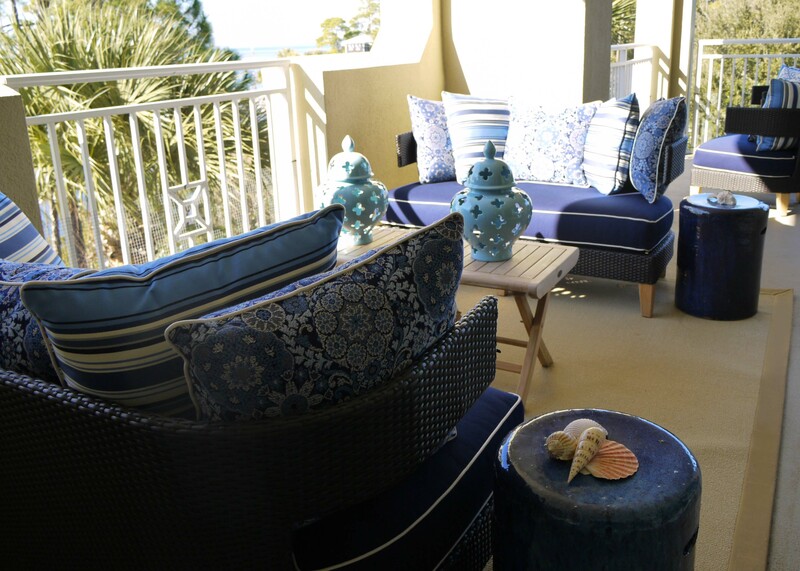 I designed the round cocktail ottoman to be navy on the sides, a natural fabric on the top, and the welts are a navy and white ticking stripe, sewn on the bias so that it would look like a blue and white cord. 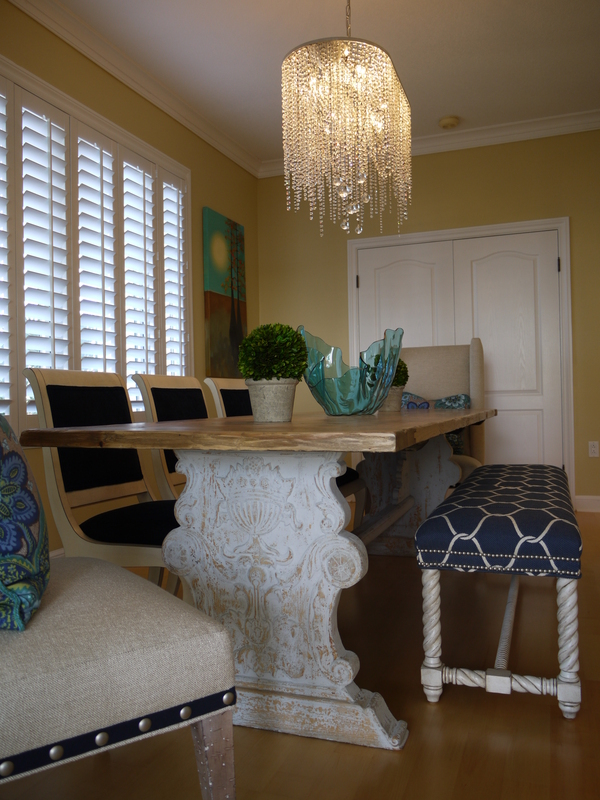 This was done to add just a touch of nautical flair. 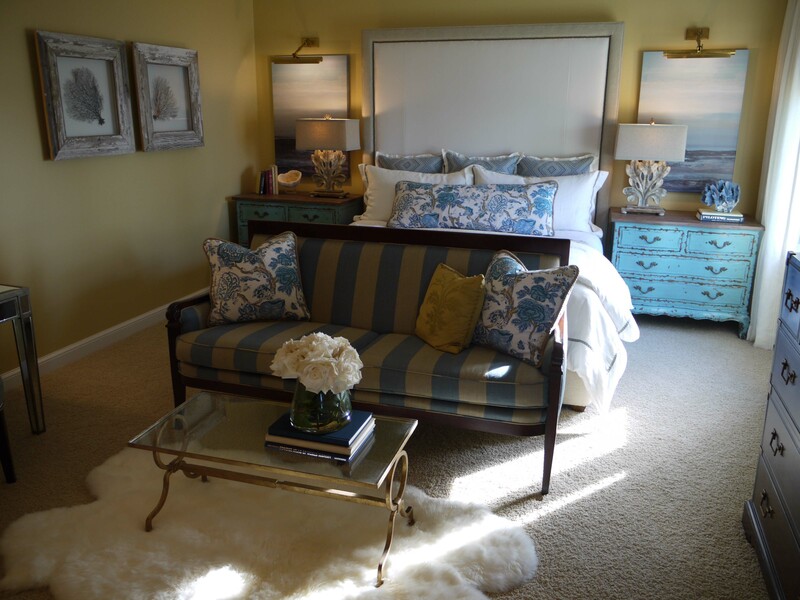 I anchored this new furniture arrangement with a custom-sized rug bound in blue linen. 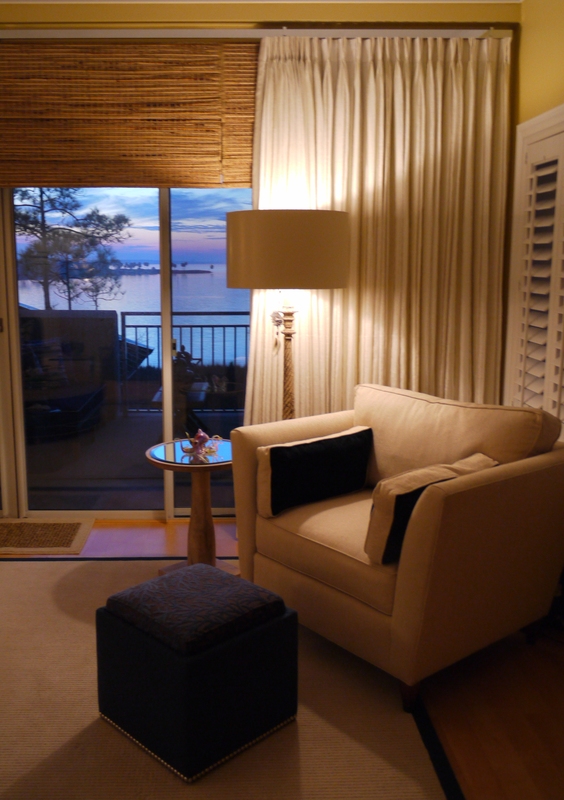 You may also notice in the before pictures that the window treatments did nothing to frame the view of the harbor! I remedied this by raising the drapes to ceiling height for drama, and mounting non-functional woven wood shades just below the rod to cover the wall above the sliders, and trick the eyes into thinking we have an entire wall of windows. The gauzy linen sheers are fully functional. They are hung on a chrome decorative traversing rod made by Vesta. 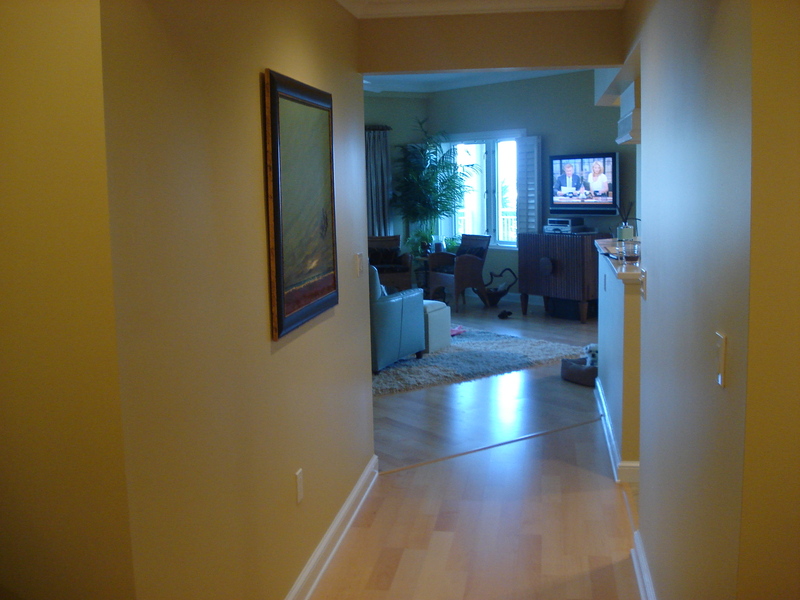 In these before and afters, you will notice that we replaced the painted cabinet on the wall between the hall and Master Bedroom with a taller storage cabinet from Palecek. 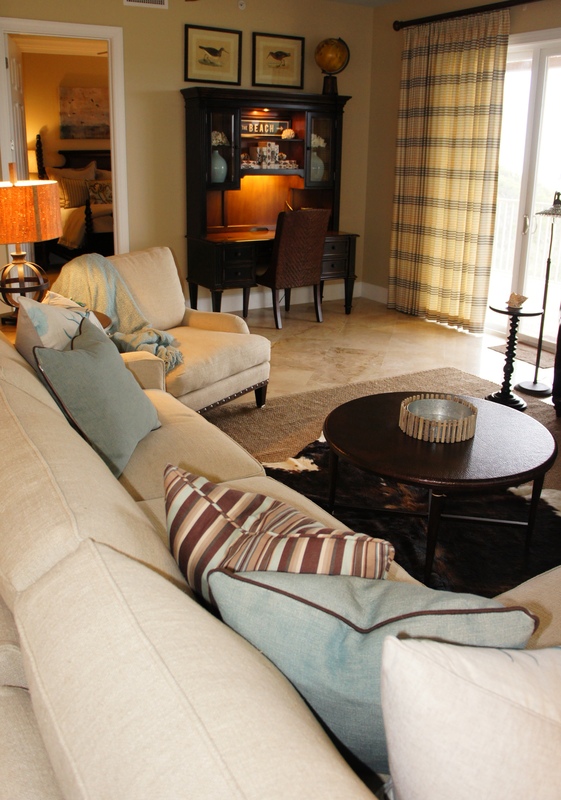 The off-white finish of the cabinet pulls out the trim color of the unit, as well as my pillow fabrics and counter tops. 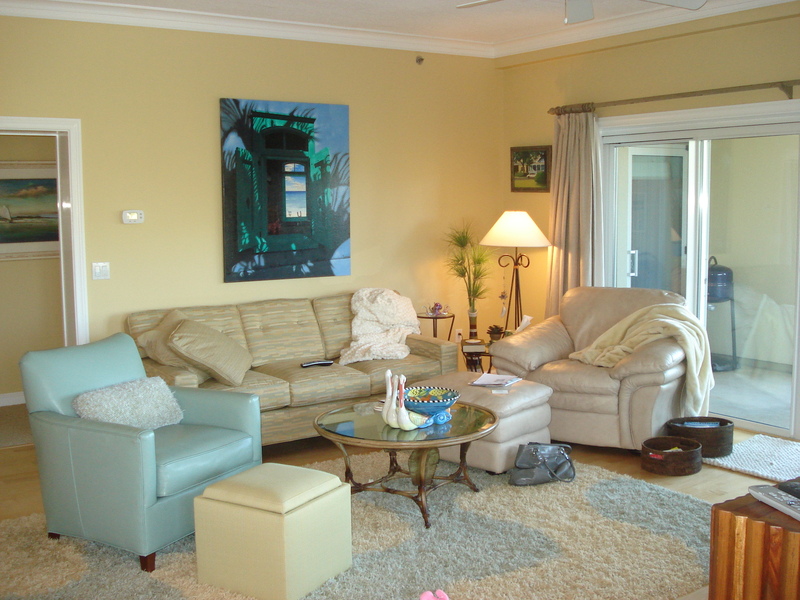 The “After” picture also shows the Living Room from another vantage point. From this view you can appreciate the colors in the chair pillows, and the shape and design of the Deco-inspired wooden Palecek chairs. 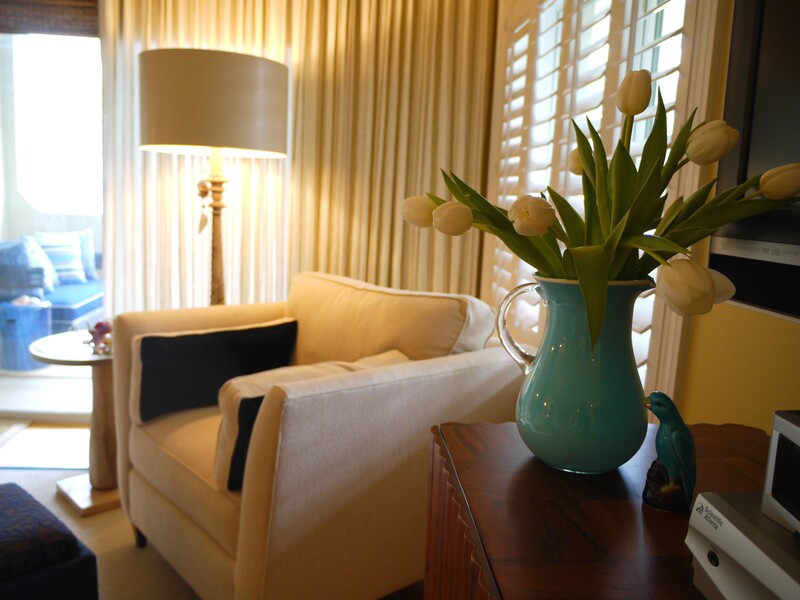 This picture gives another view of the Drexel Heritage Chair, the floor lamp by Barbara Cosgrove, and of course the beautiful fresh tulips, which give homage to the beautiful Pindler and Pindler fabric on the sofa pillows shown below. 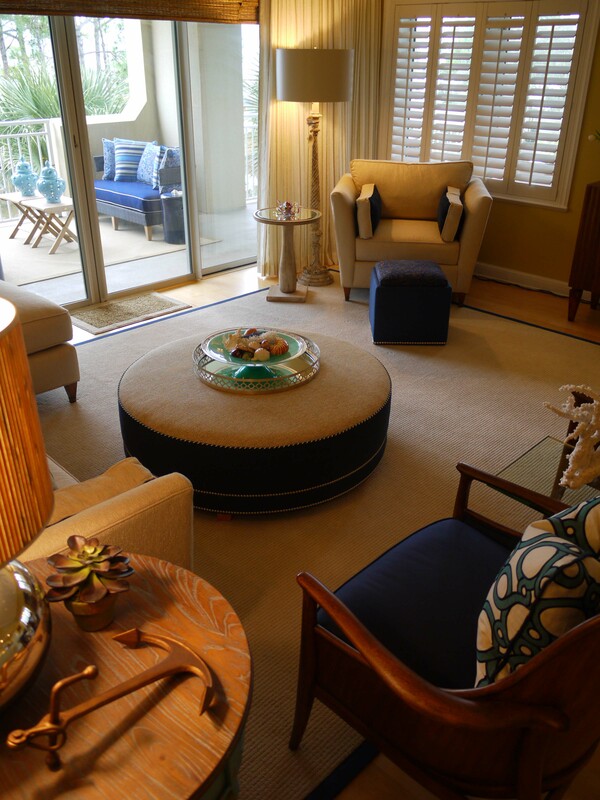 I sold the clients this round tray for the ottoman for serving, or for a place to set the remote controls for the television. I found it a very beautiful touch to add this green bowl, which pulls out the green color in the painting, since we had so much navy and blue throughout. 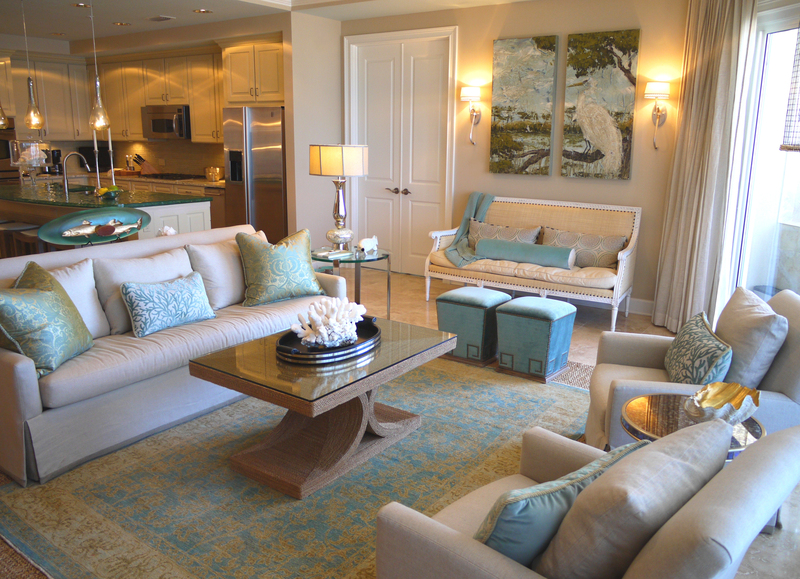 Since this sectional provided so much more seating, it took away from the ability to access a side table, or a place to set your glass of water, snack or book. Because of this, we came up with the idea of having a place behind the sofa to set these named items. I designed this wall extension that essentially created a console high enough to comfortably access, and deep enough for a cup and saucer or salad plate. 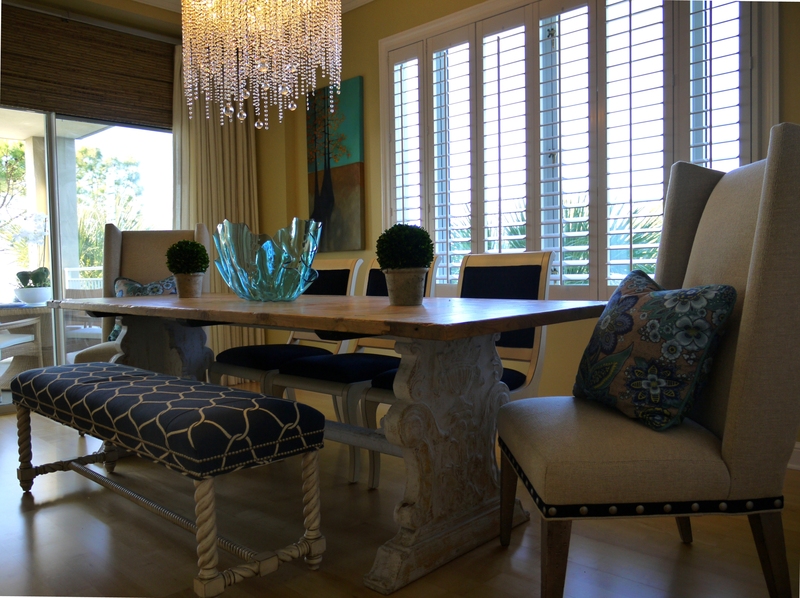 The clients could then lounge back with their arm across the back of the sofa, and casually reach their glass of wine. I could not resist showing this incredible view of the bay at sunset. 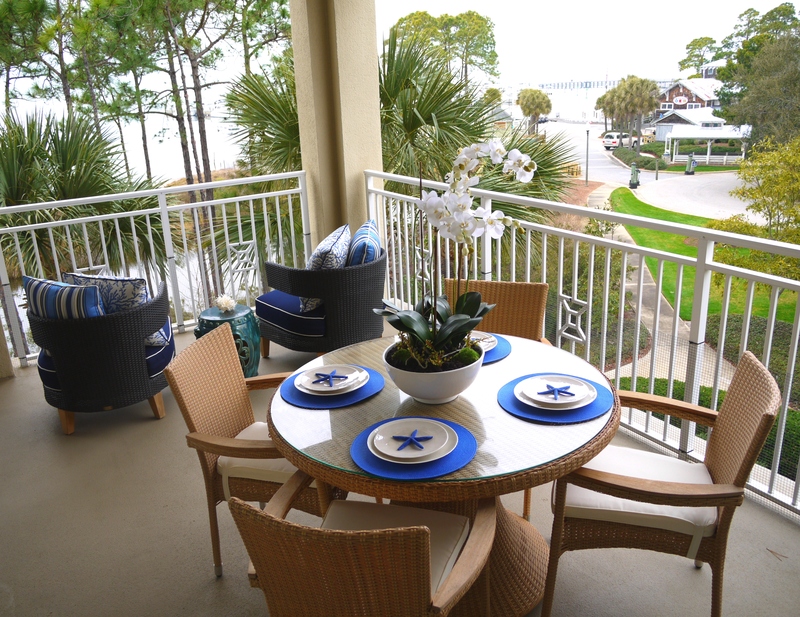 This unit has a wonder view of the marina in San Destin. 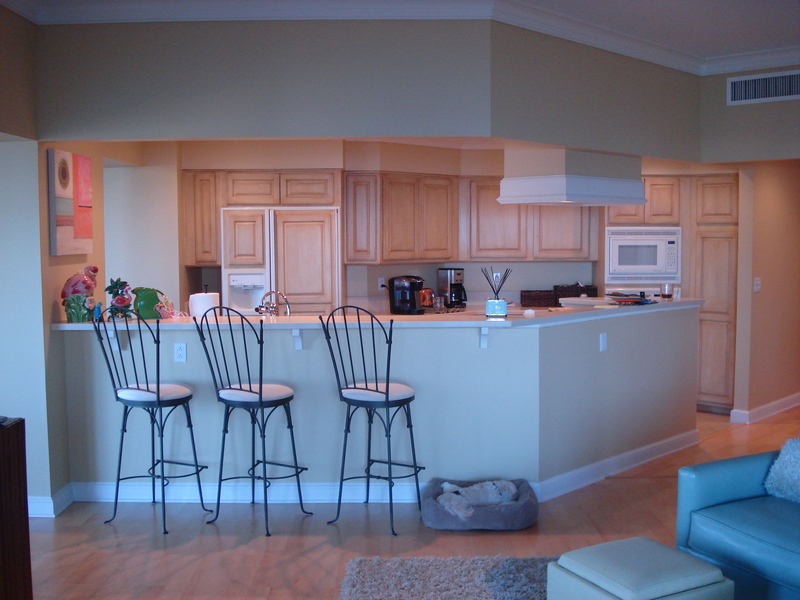 These are Before and After pictures of the Kitchen. My goal was to update the look and lighten the feel. 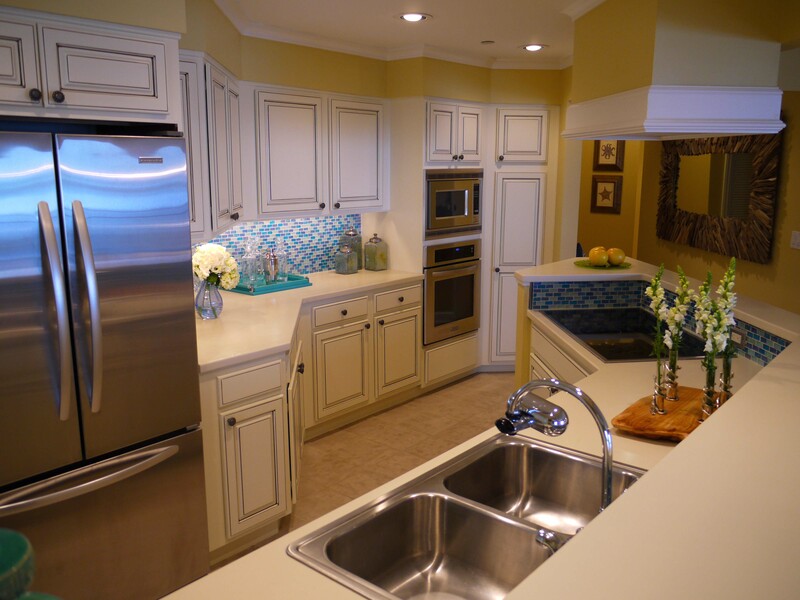 I began updating by having my client purchase sparkling-new stainless steel appliances. 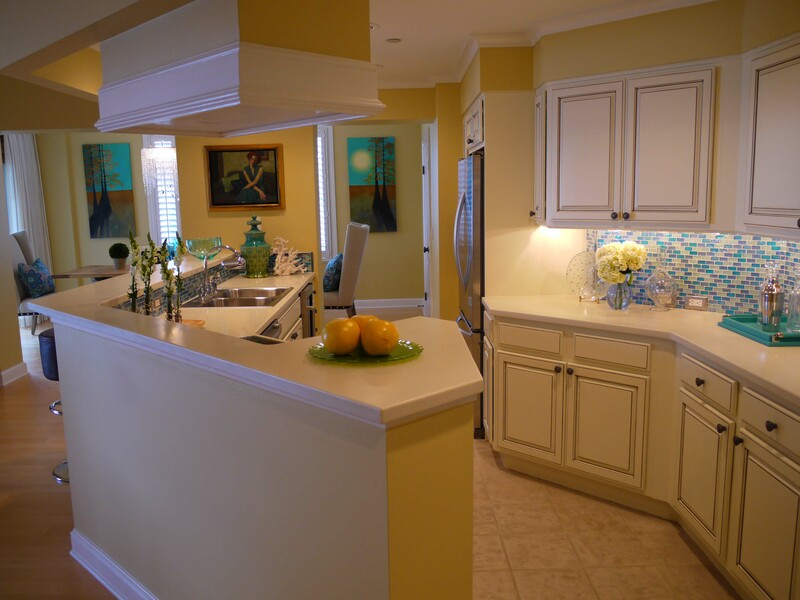 I then urged her to paint over the faux-finished wood cabinets with an off-white that matched the counter tops and helped to lighten up the look. We then added a slight brown glaze in the cracks of the cabinet doors for an extra touch of warmth. 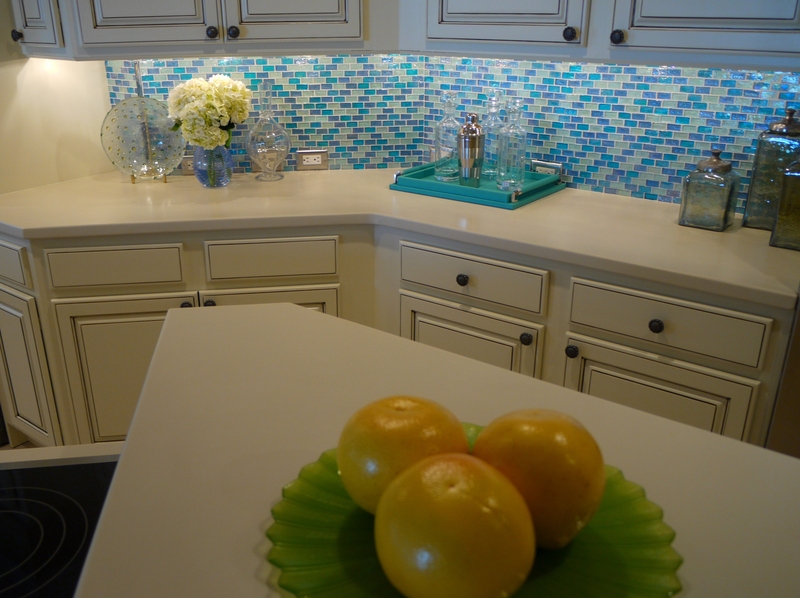 The drama was brought in with the blue glass tile backsplash! 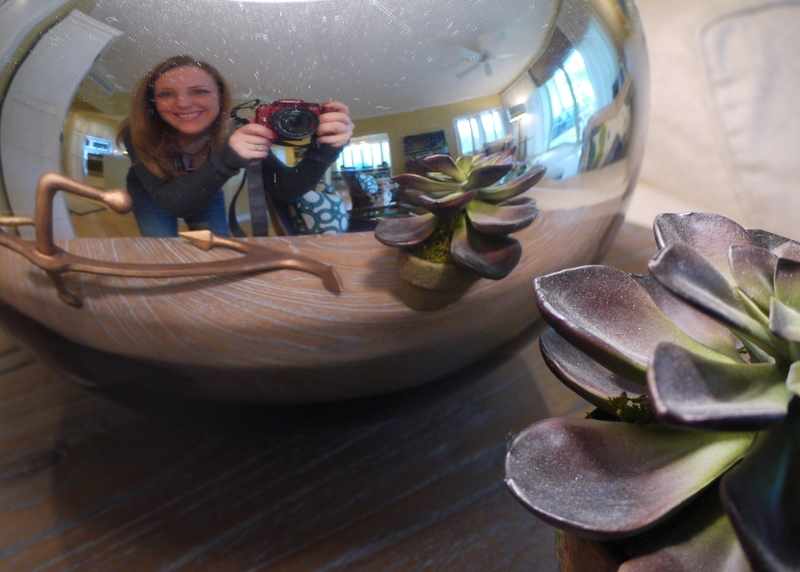 This provided a needed punch of color to the kitchen, as well as much-needed reflectiveness and depth. In the above pictures, you will get a better view of how the changes we made affected the kitchen, especially the glass tile backsplash! 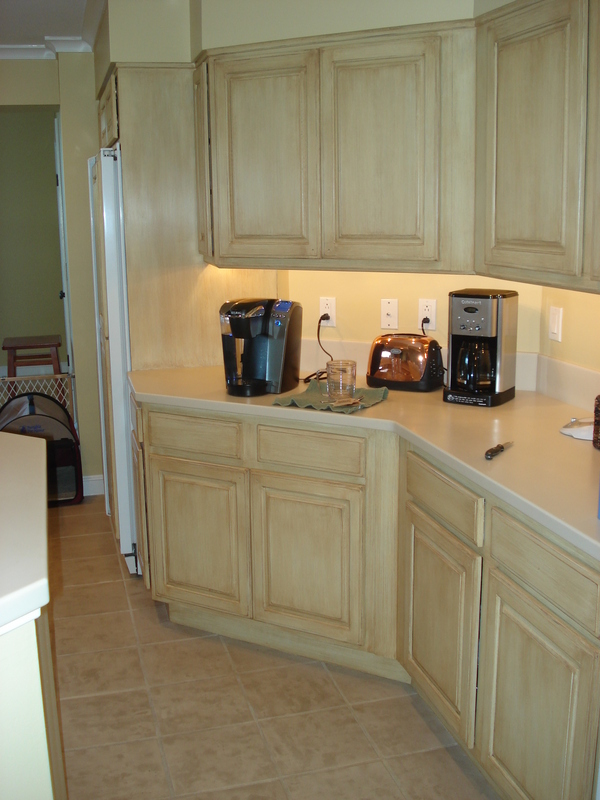 Before, it was an underwhelming extension of the counter top, with dull painted wall above it that was littered with many outlets. I wanted our new tile to be unobstructed by outlets, so I had them all turned horizontally and moved down so that they were hugging the counter top. 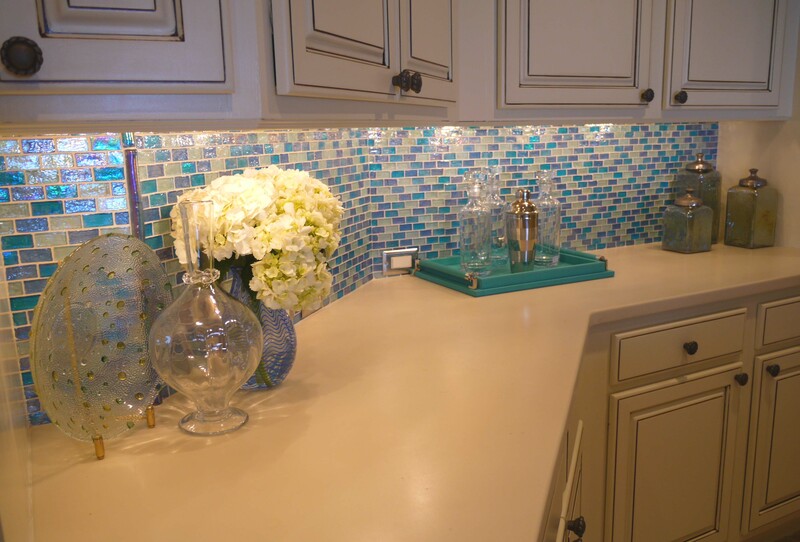 Now the under cabinet lights shine and reflect on beautiful colored tile, instead of outlets and switch plates! 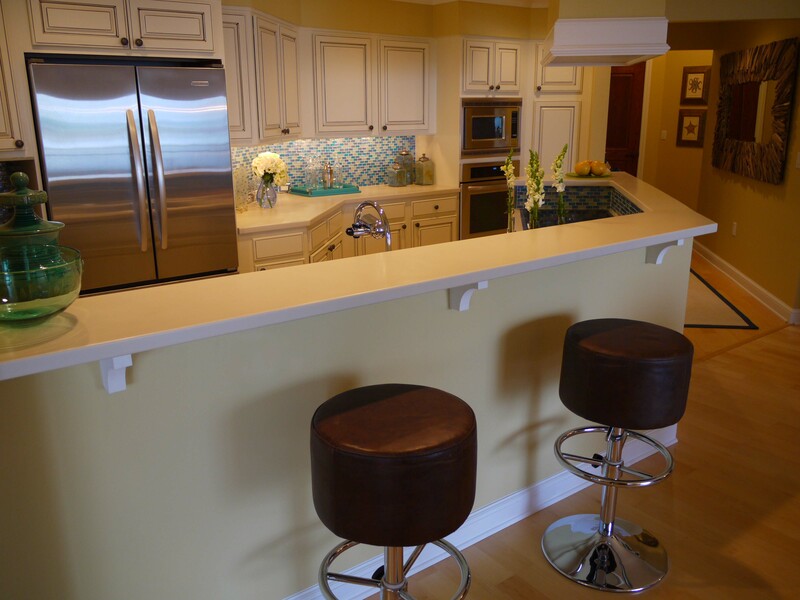 In the above picture, you can see how something as simple as adding some tile to the small area between the counter and bar can add life, color and beauty to an otherwise unnoticed area of the room. 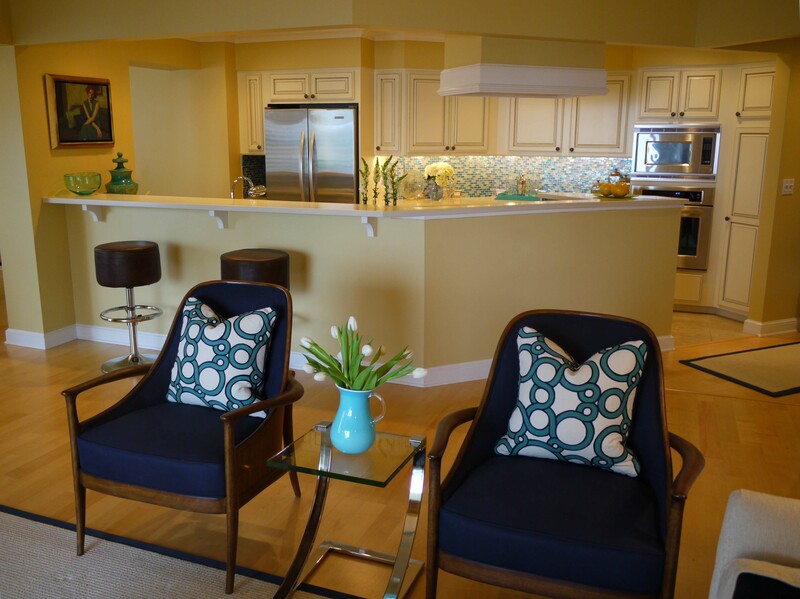 Being the heart of any home, it is wise to make your kitchen stand up to the rest of your furnishings and decor. 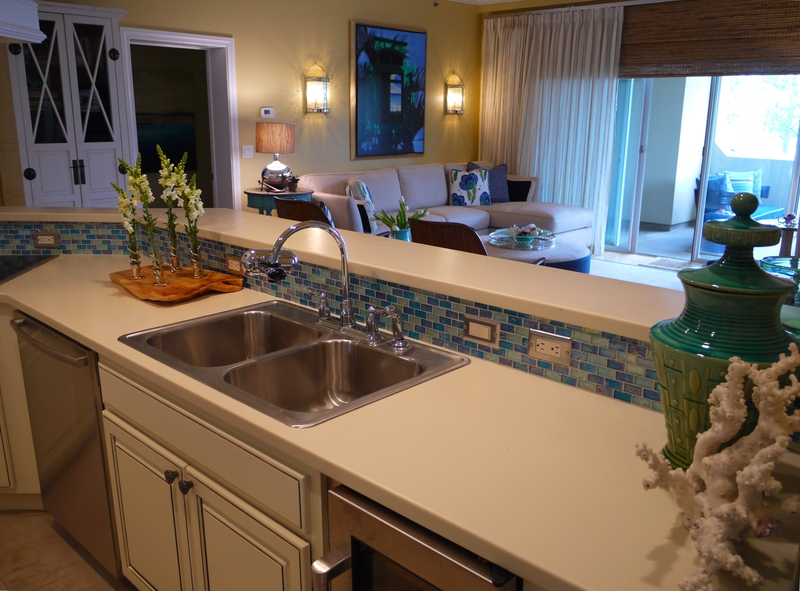 Spending a little money on backsplashes new appliances and a little paint, like shown, can usually bring you a nice return on your investment if you ever resell. 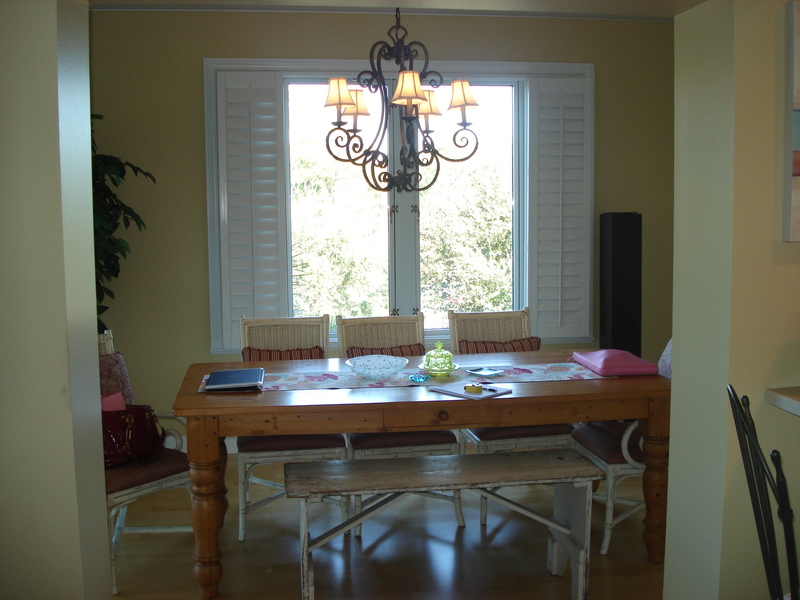 The picture above shows a larger view of the windows in the Living Room. 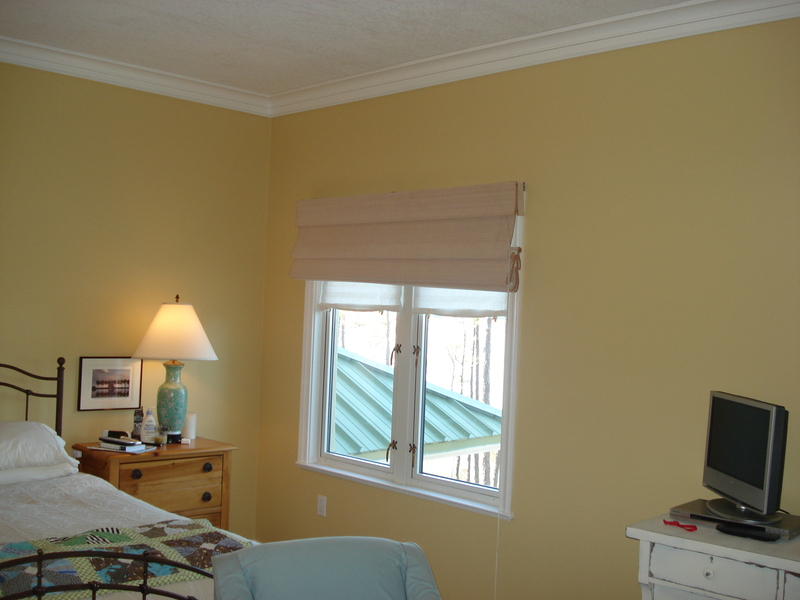 When compared to the “Before” pictures, you will see how the new window treatments serve to give the illusion of an entire wall of windows. 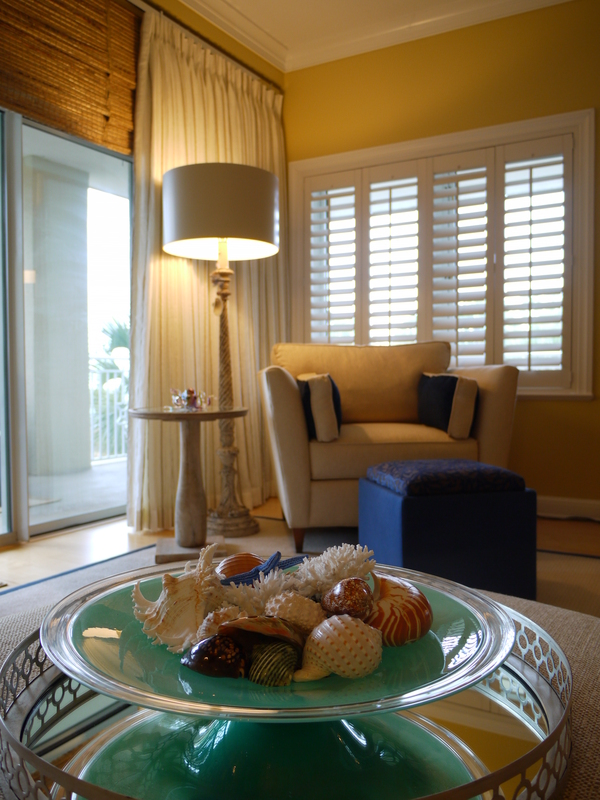 Layering the sheers over the woven wood shades provide needed texture, richness and importance to the room. This way when you look at that wall, you notice the well-framed view, and not the drape rod and empty wall. 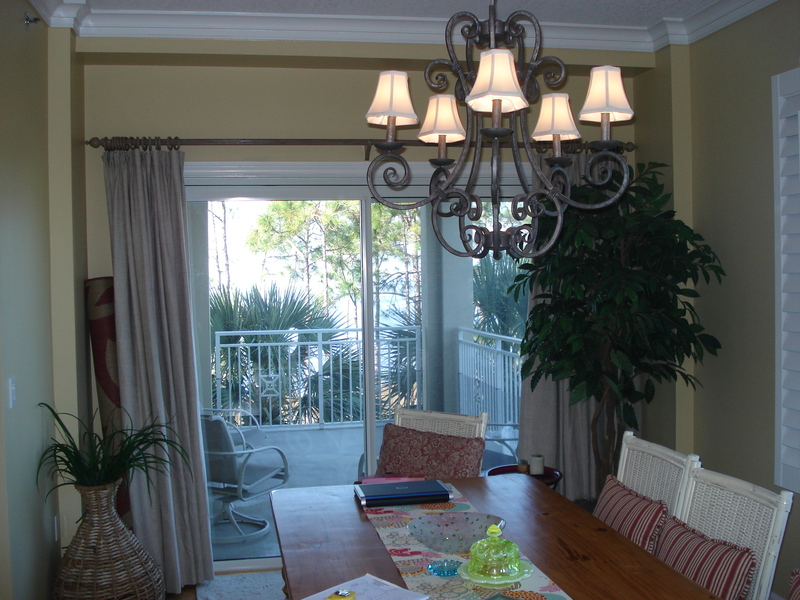 Above is the Dining Room transformation. The pine farm table used before did not mesh well with the color of the floors and wall, and was a little bit too “country” for the room. 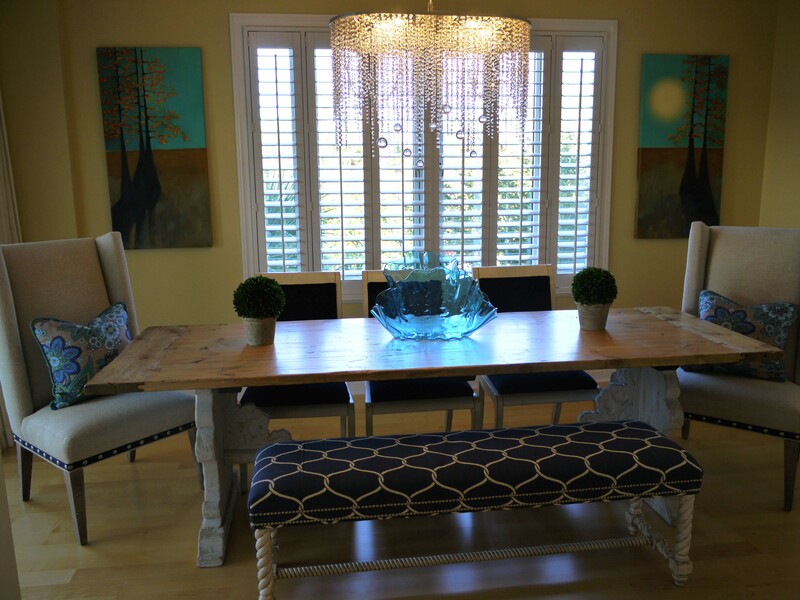 I found this wonderful antique reproduction dining table made by Sarreid and fell in love. 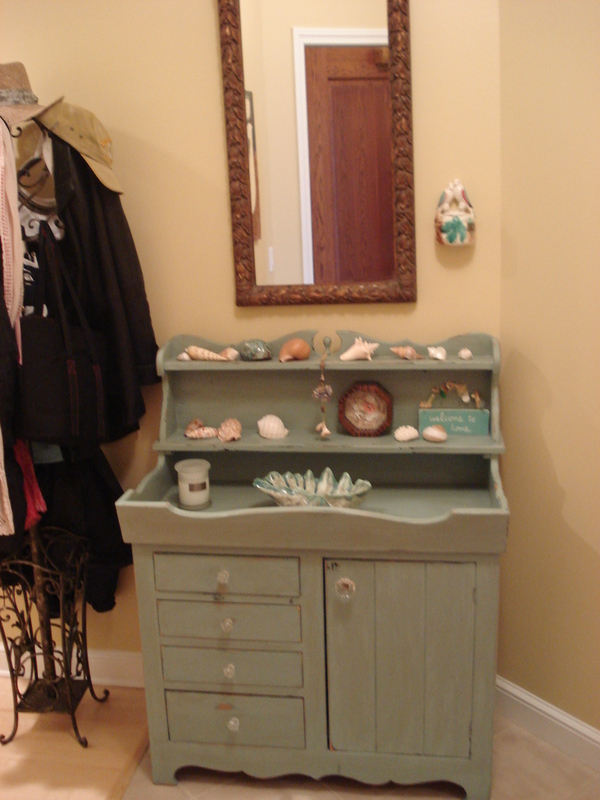 It has a carved wood base that has been painted and distressed in antique white. 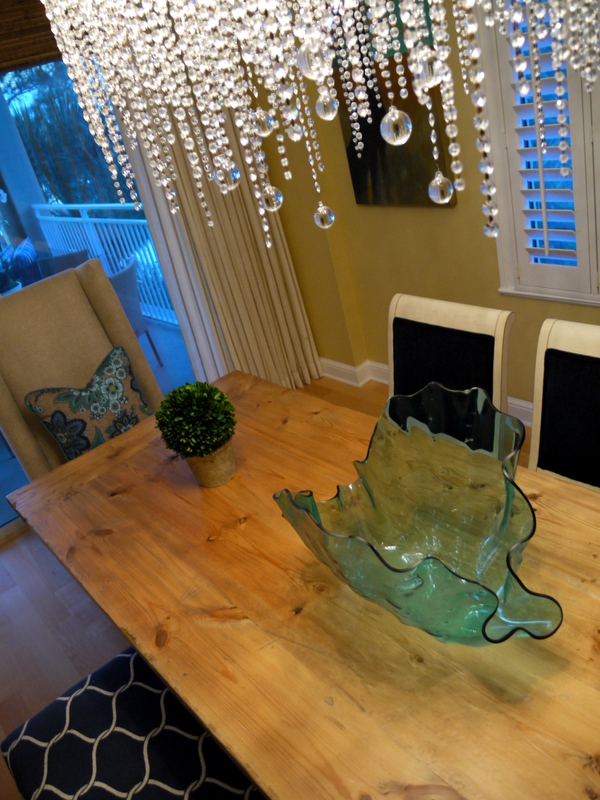 The top was an unfinished solid pine that I had treated to protect it from spills and stains, but I wanted it to remain as natural and rustic as possible, as I had big plans for its contrast–the chandelier! This Chandi chandelier is made of crystal balls in various sizes and hung at differnt heights, and was designed in an oval shape that complemented the elongated shape of the table. It resembles large droplets of falling water frozen in motion! 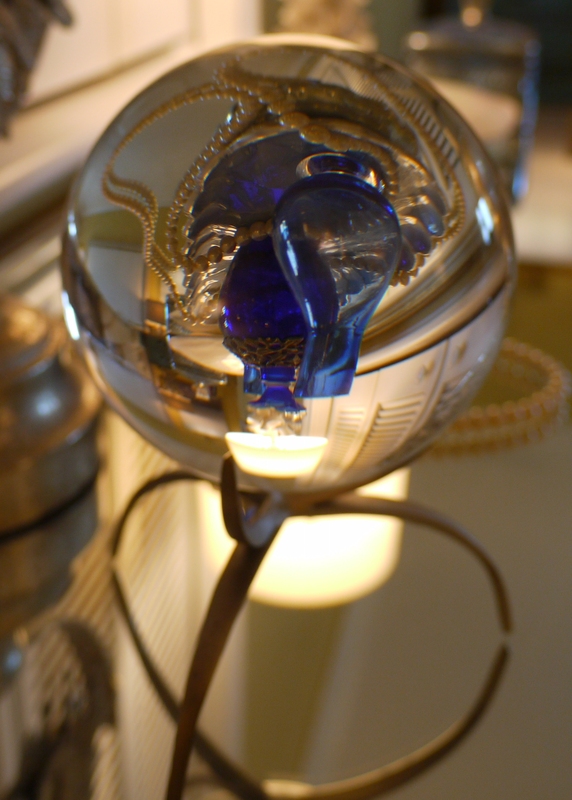 I loved how this sparkling crystal eye candy contrasted with the large, heavy rustic table. 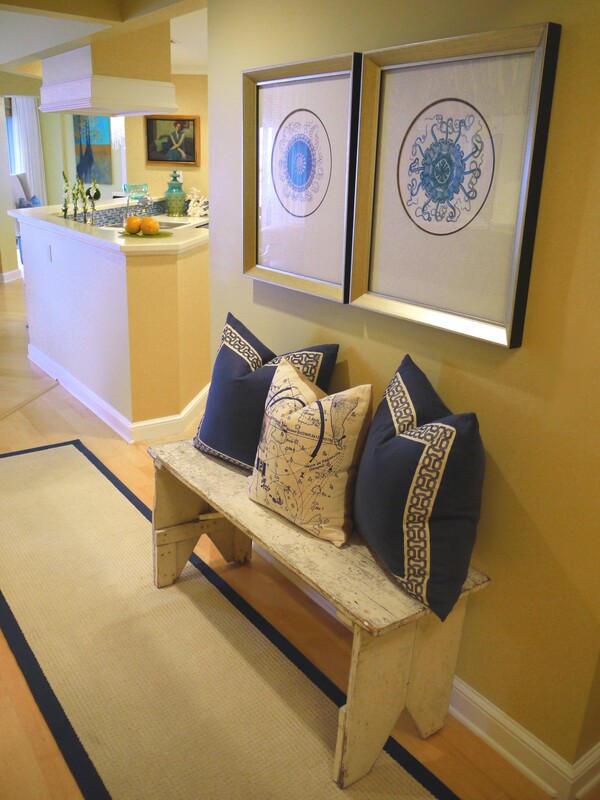 The bench in the original design I ended up using in the hallway, and replaced it with this Drexel Heritage bench. 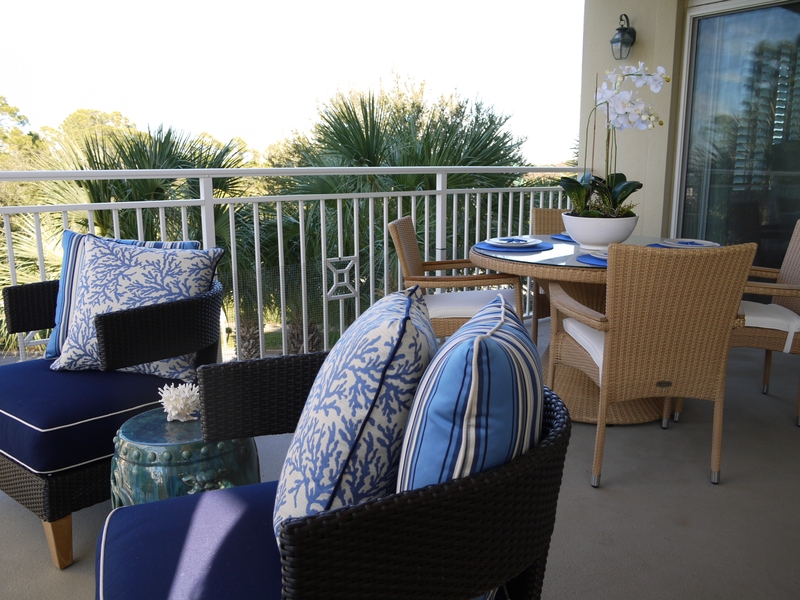 I covered it in a heavy-duty blue fabric that had a white pattern on it that resembled nautical knots or netting. 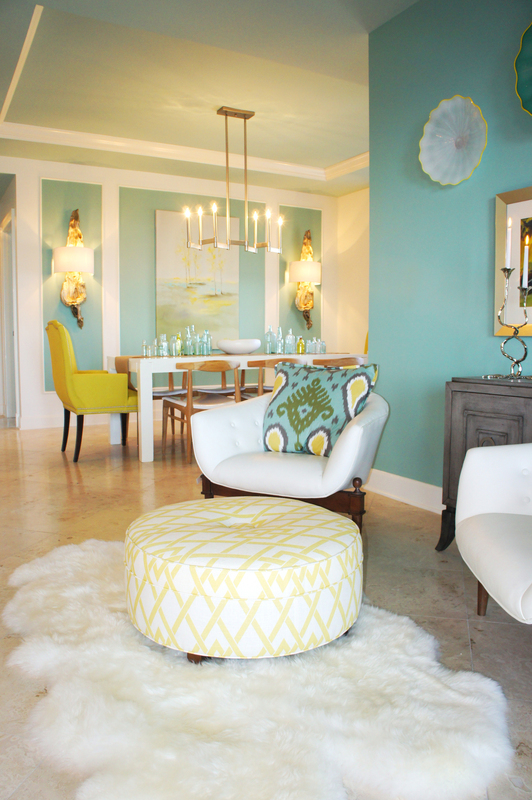 The new host and hostess chairs were ordered from Lee Industries. 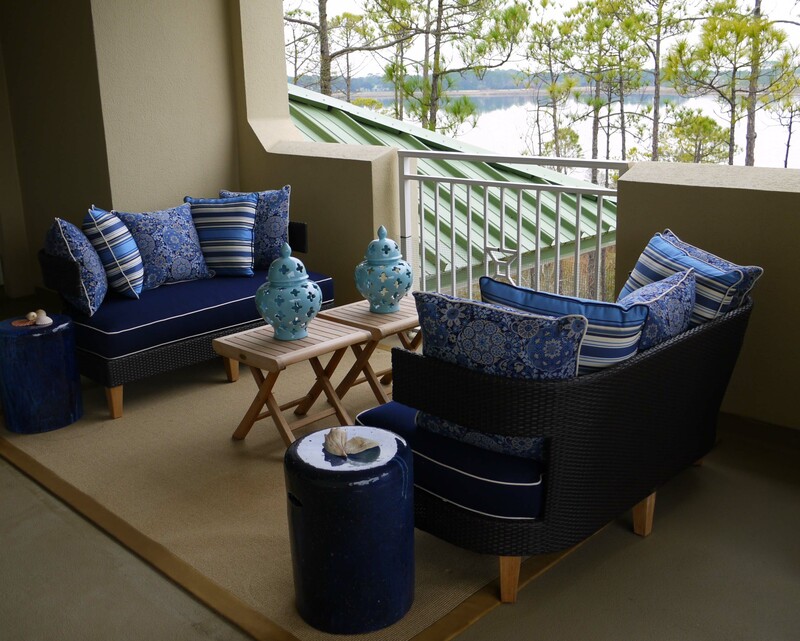 I chose a thick, durable woven linen, then banded the bottom in navy, with jumbo silver nailheads. 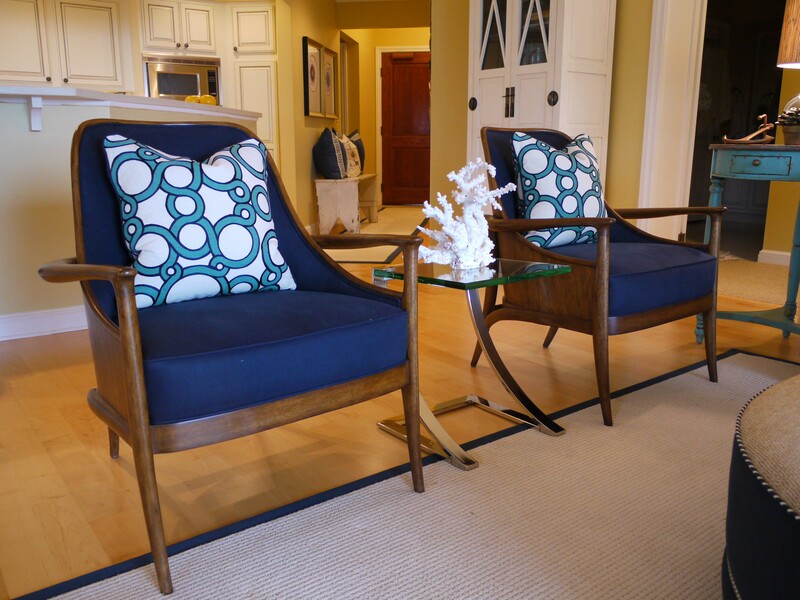 The side chairs are by Drexel Heritage, and are covered in navy woven chenille. The chandelier sparkles even more beautifully at night! 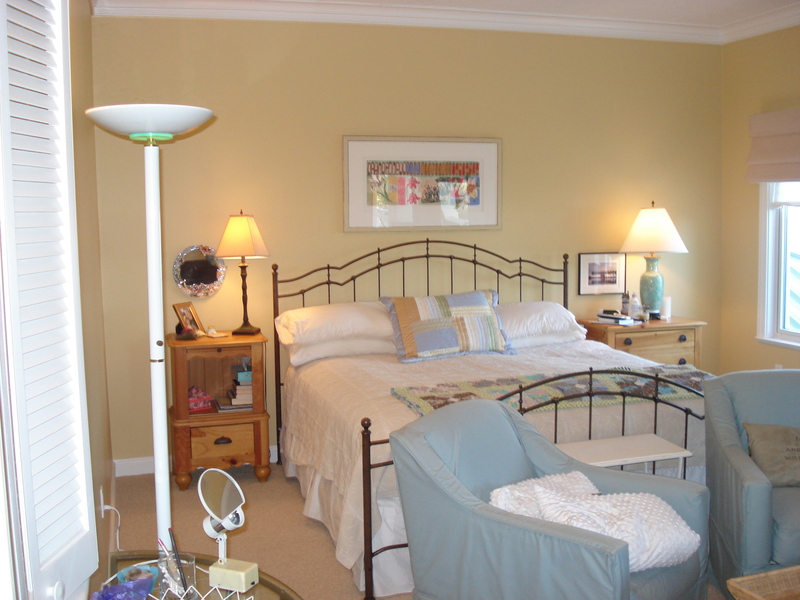 I enjoyed transforming the Master Bedroom. 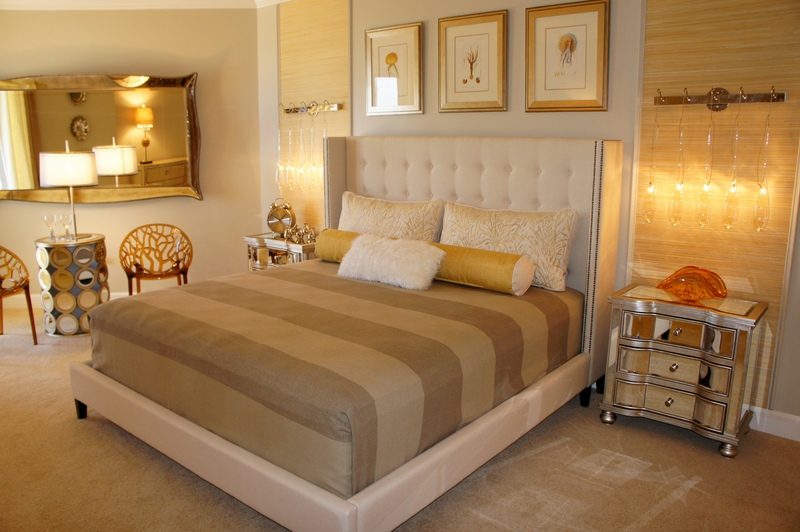 I wanted her new king bed to provide more drama and importance than the last. 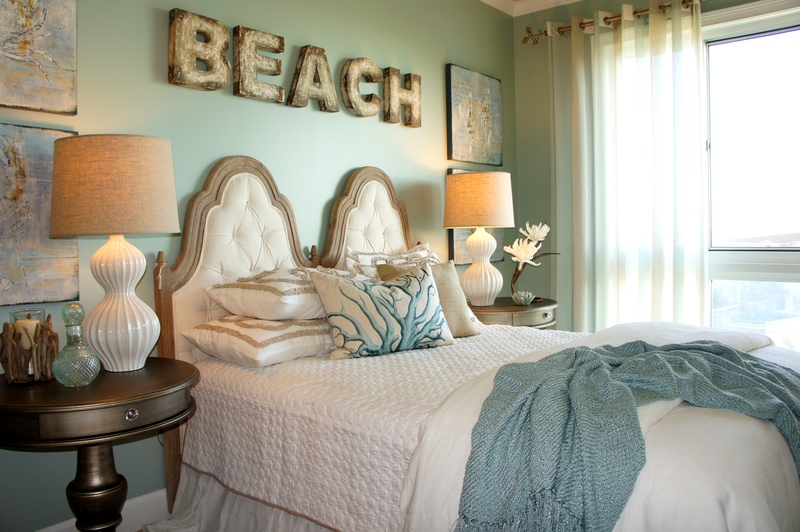 I chose this custom-height headboard from Mario and Marielena, and flanked it with two turquoise painted chests. I chose abstract landscapes to go over each nightstand to add color and depth, and highlighted them with two picture lights. I found this Milling Road settee to go at the foot of the bed. It was already covered in this beautiful wide stripe fabric that went perfectly with the design! 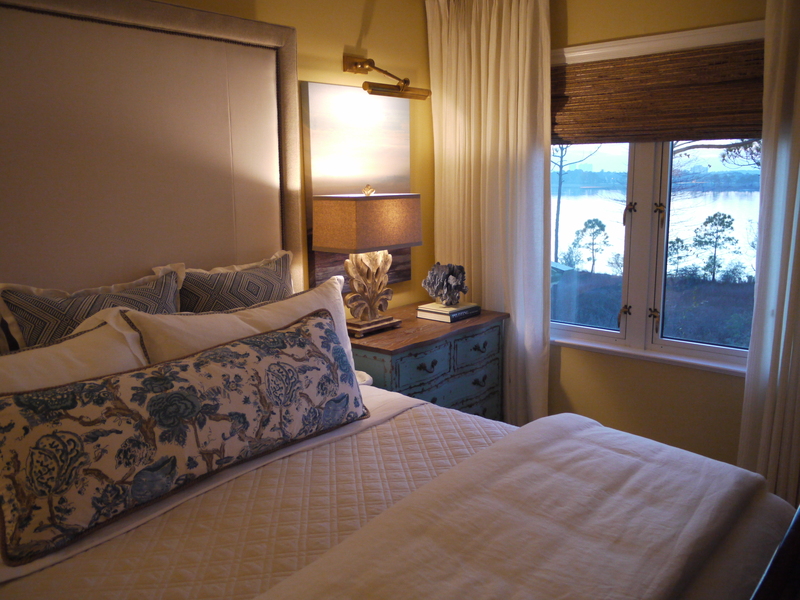 In this above Before and After, I am showing how I dressed the windows in a way that added height to the room, and stood up to the tall headboard. 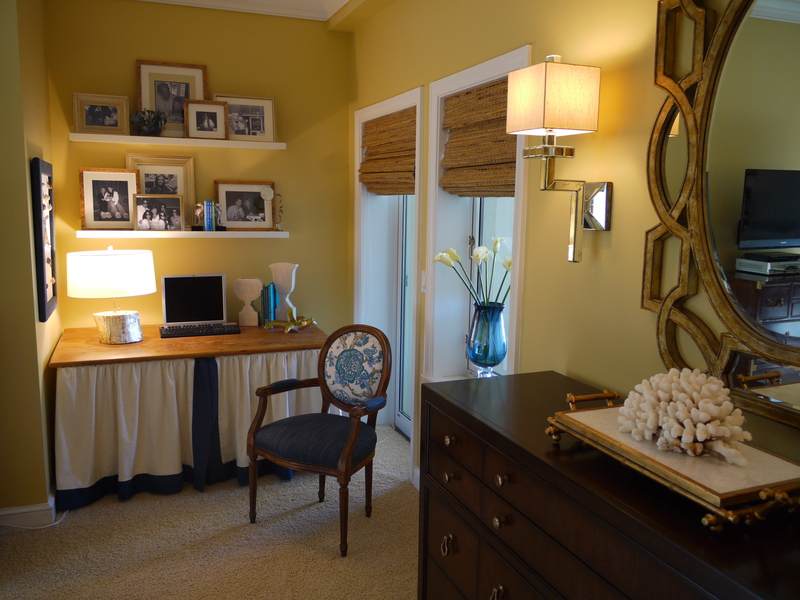 This desk area in the Master Bedroom needed a little help, but we did not want to put too much money into this particular area. 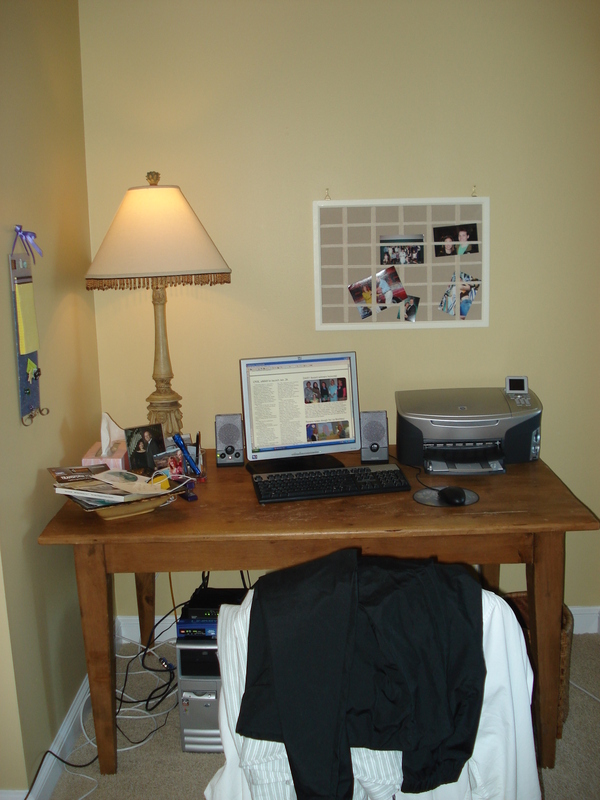 I began by keeping the table desk, and having a skirt made with a slit in the front that would hide the wires underneath, but still allow easy access. I then hung some inexpensive wall shelves and bought some frames of various sizes to create a collage of family photos. The chair was purchased on clearance and recovered in complementary fabrics. The bulletin board I had made is covered in fabrics, as well, with shell push pins. 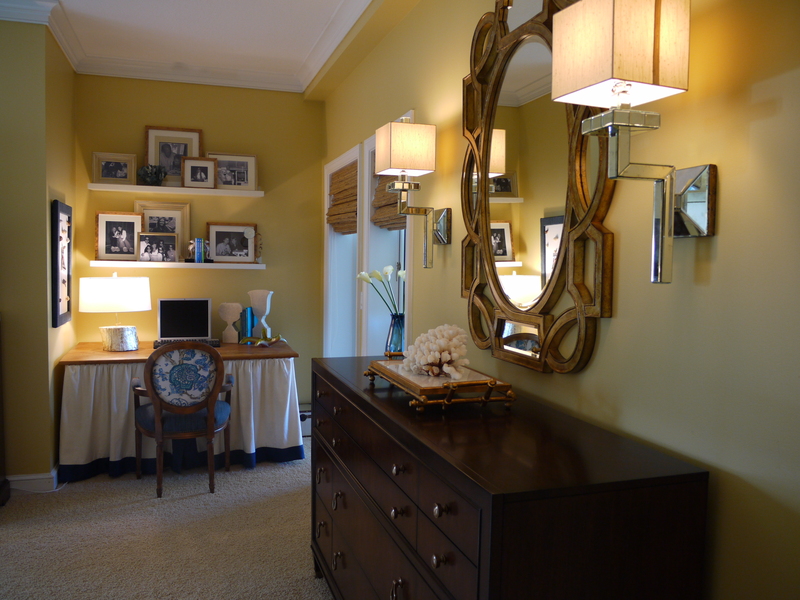 This gave the client a place to tack notes and photos in a contained area, for a clean, organized look. I took this picture to show how the interior blues pick up on the water outside as the sun begins to set. 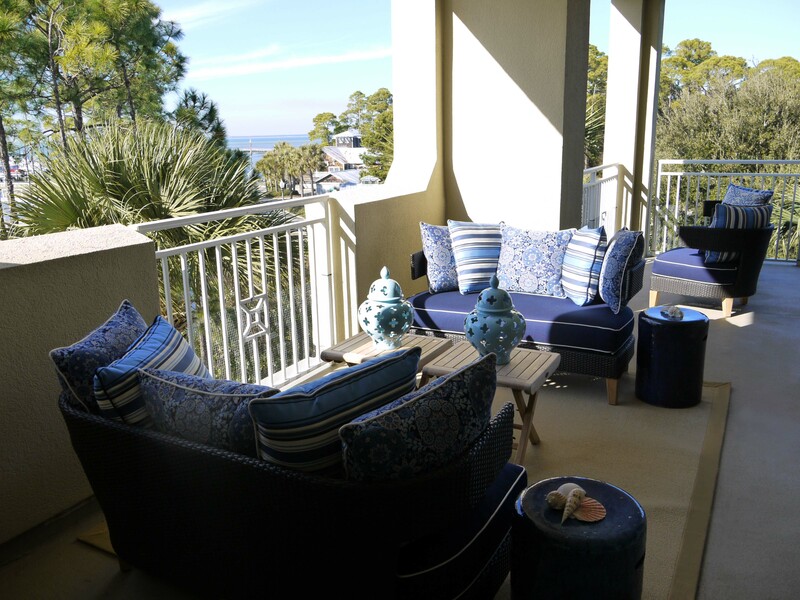 The wrap-around main balcony on this unit can be accessed from the Dining Room and the Living Room, and has a perfect view of the marina and bay. 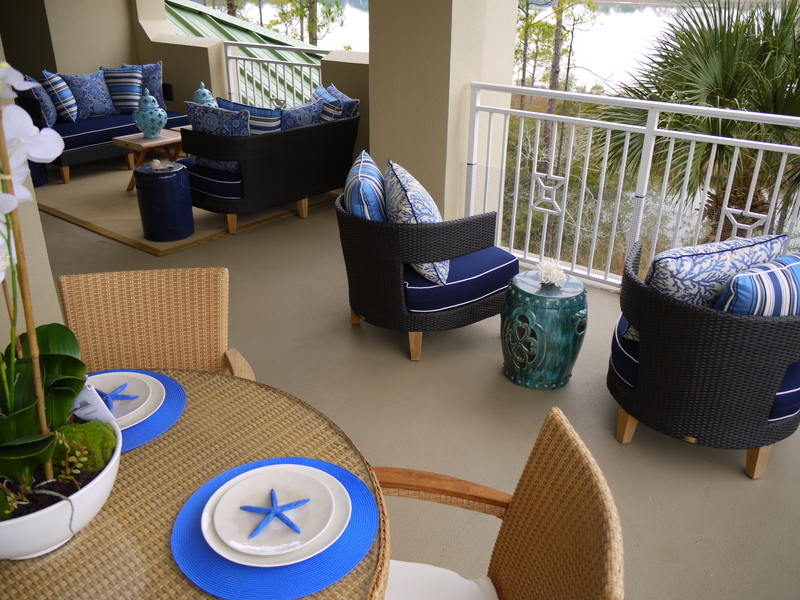 I chose Lane Venture occasional furniture in a dark synthetic wicker, and this dining group in a honey-colored synthetic wicker that pulls out the teak accents on all the other pieces. 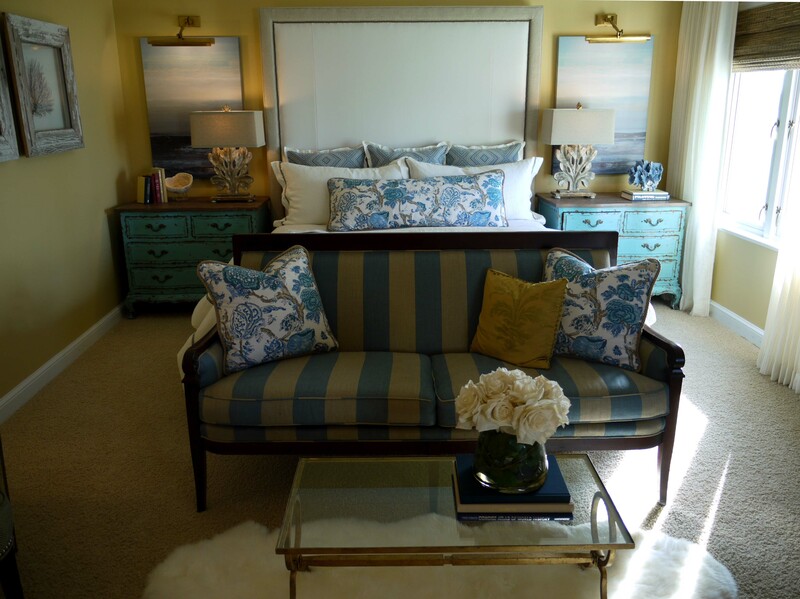 For the fabrics and accents, I chose a palette of blues, greens and aquas that complement the interior palette. 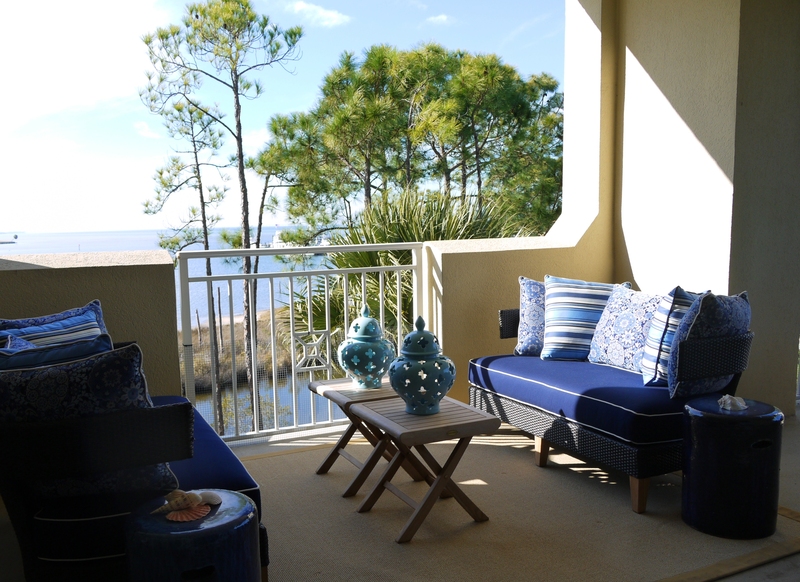 Both seating arrangements are placed strategically to maximize the view when lounging. 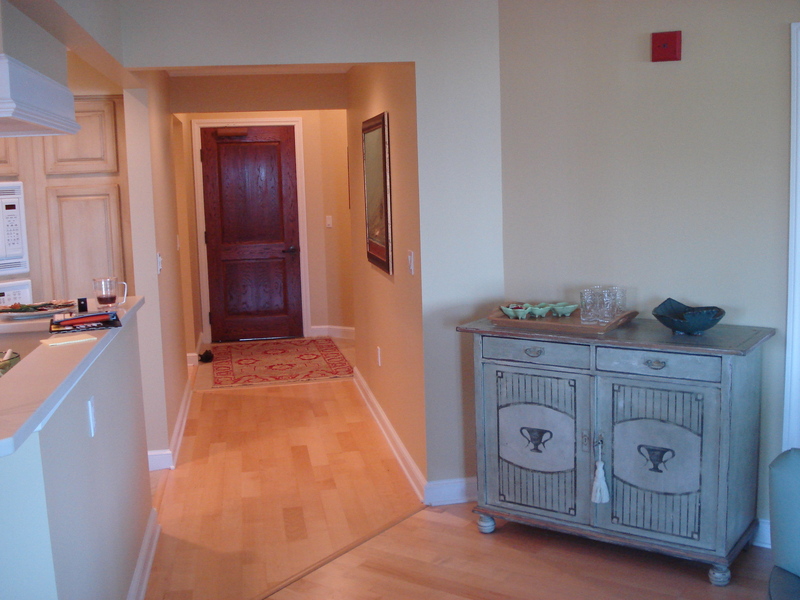 This is the hallway leading to the entry. 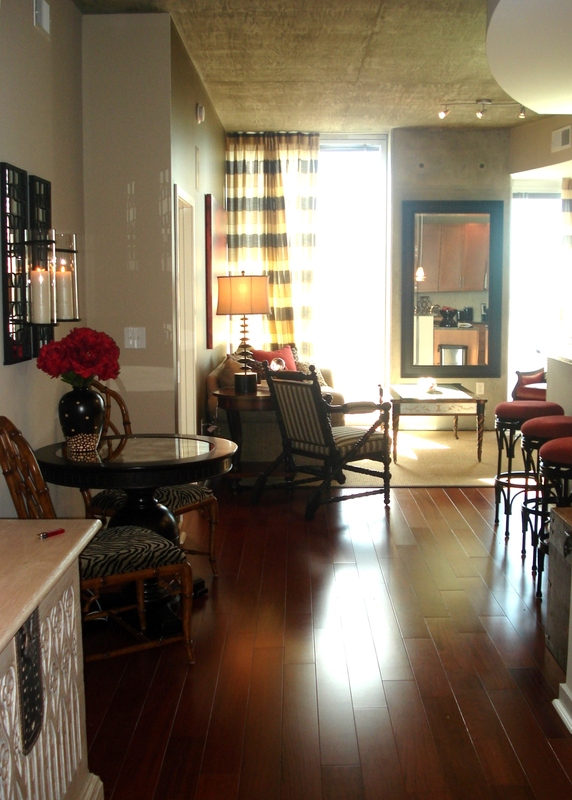 I dressed this area up by giving it a long, inviting runner to welcome people into the unit, and moved the bench from the dining room to one of the walls. 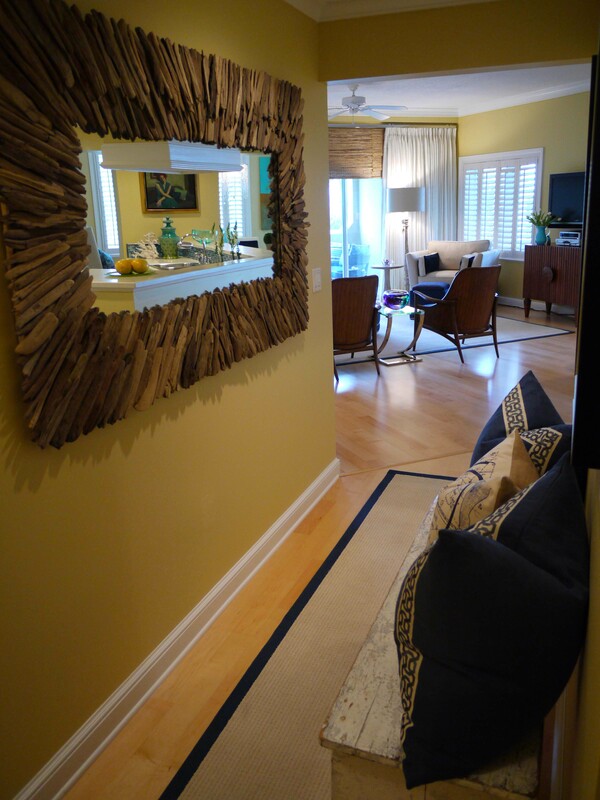 I added some nautical pillows, art and one large driftwood mirror, which served to open up the hallway and add more light. This is the Entry before and after the change. The antique basin that was being used before was cute, but did not go with the whole design. 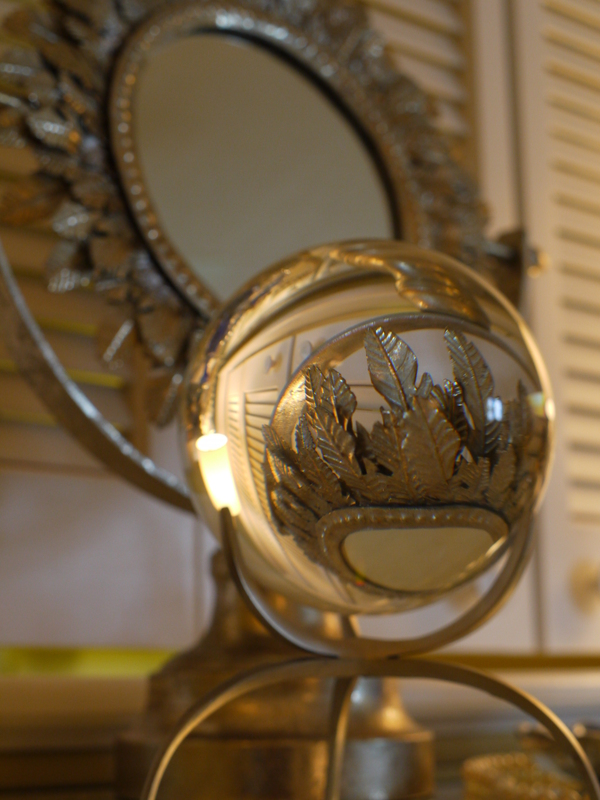 Instead, I found her this reflective antique mirror chest. 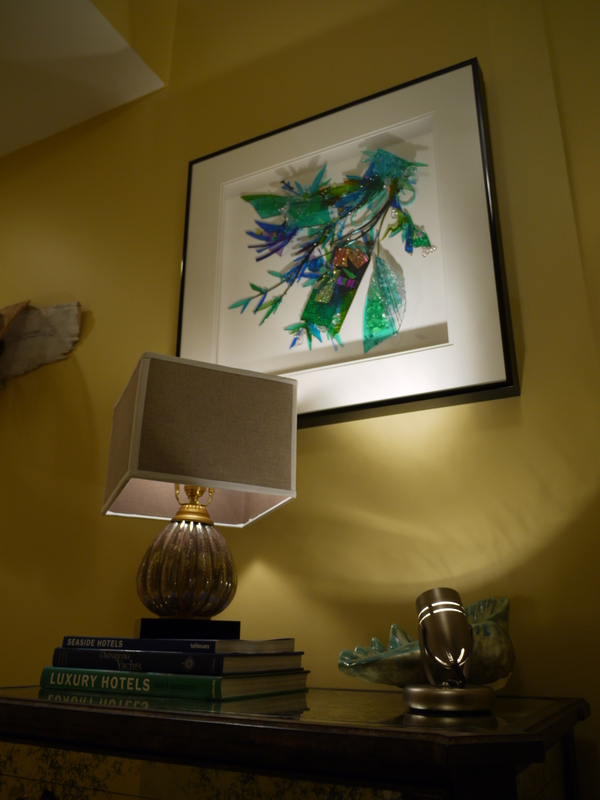 I added some light with a small lamp, and the clients were able to give some more of their original art importance by lighting it from below, as shown. I love everything! The balcony looks beautiful! Amazing job once again Cara!! Beautiful! Once again you awe me with your amazing talent. You see things in a way that most of us only wish we could. What a change! You go girl! Wow Cara, this looks awesome! I love your attention to detail. There is a thoughtfulness about your design that makes you unique. It’s nice to see your passion come through. 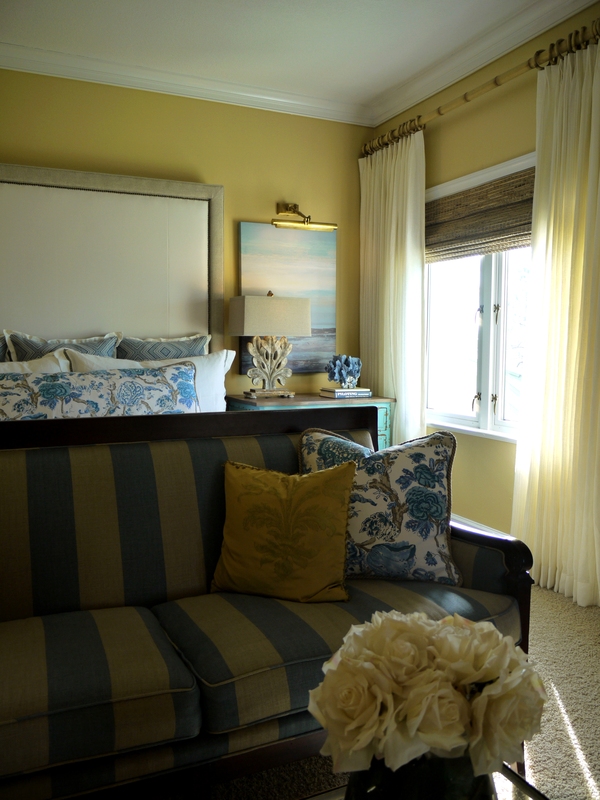 Is that Romo on your living room draperies? It looks really good! Yes! 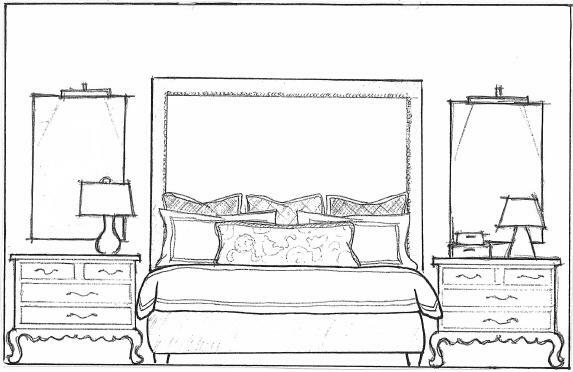 That’s Romo on the Living, Dining & Master Bedroom Draperies! I love Romo’s extra wide sheer options.